Goals from David McGoldrick and Daryl Murphy saw Ipswich defeat Millwall to claim their first win since the opening day of the Championship season. Jermaine Easter hit the bar for Millwall but Ipswich went ahead through McGoldrick's low deflected shot. It was 2-0 when Jay Tabb's corner was met by Christophe Berra and Murphy was on hand to net the loose ball. Millwall almost hit back immediately but Scott McDonald's set-piece was superbly tipped over by Dean Gerken. The result means Millwall drop out of the top six while Ipswich climb to mid-table. 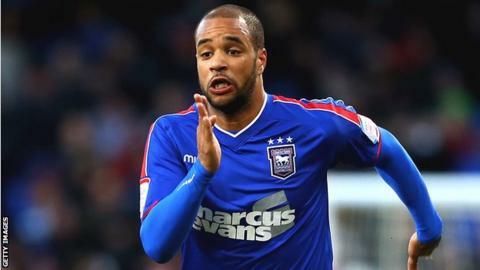 David McGoldrick and Daryl Murphy both last scored in the league on the opening day of the season which was also Ipswich's last victory in the Championship. Millwall should have taken the lead when Martyn Woolford was denied by the legs of Ipswich goalkeeper Gerken and Easter smashed the rebound against the crossbar. Easter then saw a shot from just inside the area held well by Gerken before Mathias Ranegie, making his full debut, headed over. A dull affair finally came to life in the closing stages of the first half when Woolford shot into the side netting before Millwall keeper David Forde clawed Murphy's downward header away at the angle of post and bar. The deadlock was finally broken in injury time. McGoldrick teed up Teddy Bishop, who was brought down on the edge of the area, but the Town striker - a transfer-window target for Leicester City - played on and his low shot was deflected past Forde into the far corner. Ipswich doubled their lead in the 63rd minute with Murphy tapping home from close range. Scott McDonald went close for Millwall but Ipswich should have made it three when McGoldrick sliced a left-foot shot hopelessly wide. Millwall centre-back Mark Beevers denied Paul Anderson a third with a desperate tackle before McGoldrick's deflected shot went just over. Ipswich manager Mick McCarthy: "David McGoldrick played properly despite the disappointment. "He has trained really well and that performance proves it. He was excellent again. "They were the better team for the opening 30 minutes but it was a very good win against a very good team. We grew into the game and we were by far the better team in the second half." Millwall manager Ian Holloway: "Sometimes it's about how you lose games and to be honest we didn't look like getting back into it. "The best team won. The longer it went on, the worse we got and I am surprised by that. "Since I have been here, we have got people to stand up and have confidence to keep going and keep going but we didn't do that today." Match ends, Ipswich Town 2, Millwall 0. Second Half ends, Ipswich Town 2, Millwall 0. Corner, Millwall. Conceded by Conor Sammon. Attempt blocked. Carlos Edwards (Millwall) right footed shot from outside the box is blocked. Attempt saved. Ed Upson (Millwall) right footed shot from a difficult angle and long range on the left is saved in the bottom left corner. Christophe Berra (Ipswich Town) is shown the yellow card for a bad foul. Ricardo Fuller (Millwall) wins a free kick on the left wing. Ed Upson (Millwall) wins a free kick in the defensive half. Attempt missed. Mathias Ranégie (Millwall) header from the centre of the box misses to the left. Assisted by Scott Malone with a cross. Foul by Magaye Gueye (Millwall). Daryl Murphy (Ipswich Town) wins a free kick in the defensive half. Attempt blocked. David McGoldrick (Ipswich Town) left footed shot from the left side of the box is blocked. Assisted by Daryl Murphy. Offside, Ipswich Town. Cole Skuse tries a through ball, but Luke Chambers is caught offside. Attempt blocked. Ed Upson (Millwall) right footed shot from outside the box is blocked. Assisted by Scott McDonald. Attempt missed. Scott McDonald (Millwall) left footed shot from outside the box is high and wide to the left following a corner. Corner, Millwall. Conceded by Cole Skuse. Corner, Ipswich Town. Conceded by Mark Beevers. Attempt blocked. David McGoldrick (Ipswich Town) right footed shot from outside the box is blocked. Assisted by Jay Tabb. Substitution, Ipswich Town. Conor Sammon replaces Paul Anderson. Offside, Millwall. Scott Malone tries a through ball, but Ricardo Fuller is caught offside. Scott McDonald (Millwall) wins a free kick in the defensive half. Foul by Paul Anderson (Ipswich Town). Corner, Ipswich Town. Conceded by Mathias Ranégie. Attempt blocked. Paul Anderson (Ipswich Town) left footed shot from the centre of the box is blocked. Assisted by David McGoldrick. Attempt saved. Carlos Edwards (Millwall) right footed shot from the right side of the box is saved in the centre of the goal. Assisted by Ricardo Fuller. Offside, Ipswich Town. David McGoldrick is caught offside. Attempt missed. Daryl Murphy (Ipswich Town) header from the centre of the box is close, but misses to the left. Assisted by Paul Anderson with a cross. Offside, Millwall. Alan Dunne tries a through ball, but Magaye Gueye is caught offside. Attempt missed. Scott McDonald (Millwall) right footed shot from the left side of the box is just a bit too high. Assisted by Scott Malone. Attempt missed. David McGoldrick (Ipswich Town) left footed shot from the centre of the box is high and wide to the left. Assisted by Daryl Murphy.